Home Newsletter 2018 - October Blow Up Your Annual Client Maintenance Program! 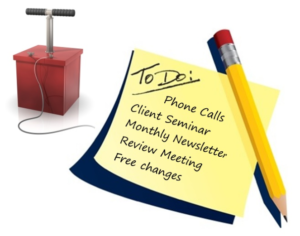 Blow Up Your Annual Client Maintenance Program! In this article, I addressed the marketplace issues confronting estate planning attorneys, in particular commoditization of our “products” and increasing low price competition. One of the ways that I discussed to combat these issues is to emphasize how your “product” is better than your competitors’. Another way to differentiate yourself is to emphasize your “service after the sale.” When someone purchases a car, he or she wants to know what kind of service or maintenance program is available and what the cost will be. This is a great way to position yourself as the preferred consumer choice. Over the past few years, a number of estate planning attorneys have adopted annual maintenance programs for their clients, where clients pay a relatively low monthly or annual fee to obtain certain ongoing services. Theoretically, this is a great way for you to annuitize the value of your practice and create a “guaranteed” base income each year from your existing client base. However, this is an area (amongst others) where I am a contrarian. I base my view upon not only my own experience but the experience of other estate planning attorneys with whom I have regular contact. According to an unscientific survey of attendees to my “Ultimate Level” training program, about 25% of them have an annual client maintenance program for which they charge their client an additional fee. Some of them have done a very good job of signing up a high percentage of their clients for this annual maintenance program and are generating a good deal of revenue from it. However, in my own experience, as well those of several other colleagues I’ve spoken with, after about 2 to 3 years these types of annual maintenance programs often experience a significant drop off of not only revenue but clients themselves, as clients decide to go elsewhere once they realize (and are miffed) that they’re receiving a lot more fluff than stuff. Okay, let’s assume that you don’t have a lot of drop off of clients from the maintenance program. You still have to consider the collateral headaches. You have additional ongoing overhead expenses just to get the “stuff” out each year, particularly if you include ongoing title transfers and document amendments. You may need additional staff just to provide all the service components of the maintenance program. You also have the additional management involving your time as well as possible additional client meetings on a regular basis. Plus, after 2 or 3 years, you have to scratch your head and become increasingly inventive to figure out what new service components, products or seminars to add to the program that members haven’t already taken advantage of or view as an incentive to keep renewing. And here’s another consequence you may not have thought about – – you are creating a liability on your books, an obligation to continue to service clients for which you’ve already been paid, that may become a roadblock if you ever want to sell your practice or retire. Believe me – – based on the feedback I’ve received from other estate planning attorneys and the feedback they’ve received from clients they’ve lost – – over time, the client, you and your staff will begin to dislike this type of maintenance program (or should I use a stronger word than dislike!). So what’s the better alternative? In my experience, it’s a free service package! You may be thinking, “How can a free service package wind up generating me more revenue?” Bear with me, because I’m going to show you how a free service package will not only trump your competitors who don’t offer a service package, but blow your competitors, who are currently providing maintenance fee plans, clear out of the water! What does my free service package consist of? It includes such things as free phone calls, free periodic notices and seminars as laws and estate planning technology change, a free newsletter, a free meeting with the successor trustee when the client becomes ill, disabled or passes away – – and most importantly a free client “checkup” meeting every three years. At the checkup meeting, we not only make sure that the plan is up-to-date with the law and recent planning technology. We also check to make sure that all asset titles are in the trust. At the conclusion of this free checkup, we determine what (if any) work needs to be done, we quote the client a fixed fee in advance for any amendments or title transfers and the choice to proceed is up to them. Frankly, this results in a lot more happy clients, who prefer to “pay as you go”, only for what they really want or need. Clients have already been conditioned to understand – – from dealing with other professionals like doctors, dentists and CPAs – – that periodic checkups are necessary and they are accustomed to being quoted a fee in advance if further professional assistance is necessary. This free service package approach also results in far more living trust and estate administration work, not only from the happy clients themselves, but from their referrals and their advisors’ referrals. Let me compare for you, utilizing real numbers, how an annual maintenance fee program falls far short of this free service package approach. These numbers are based on my own experience, having also implemented an annual maintenance fee program for a short time, as well as on the experience of other estate planning attorneys whom I’ve spoken with. Let’s say you have an annual maintenance fee program. You have 500 clients and we assume (very optimistically) that 85 percent of them (425) sign up for a $300 per year plan. This results in total revenue of $127,500. Let’s further assume (best case) that all these clients stay in your plan for three years (or the ones dropping off are replaced by new clients). You now have, over this three year period, gross revenue of $382,500. But keep in mind that’s only the gross. You have lots of additional staff hours involved and work of your own to create and deliver the promised maintenance plan items and this time and expense only gets worse if there actually is a major law change and you include free changes as part of your program. In other words, your actual net profit is far less than the $382,500. Now let’s compare the free service package approach. Here we do a free checkup meeting with clients every three years (by the way, even before I talk about the revenue involved, note that this saves us two years of client meetings and additional work by attorneys and staff). Let’s assume that during these three years 40% of the 500 clients (a total of 200) do amendments to their plans of approximately $1,900, for total revenue of $380,000. Note that this is about the same revenue as with the annual maintenance fee plan – – but without the time and expense of servicing all the clients every year! (Note: The 40% amendment assumption is actually low in our experience because we pre-program our clients to know that they will be coming back in every three years and we actively bring them back in rather than wait for them to call.) Keep in mind that, like the annual maintenance fee program, the cash flow from the free service package will be spread over the same three years because we will be bringing in some of the clients each year as they come up on the calendar for their three year checkup. Now, let’s show you why the free service package is considerably better! These numbers don’t include the occasional amendment project where clients actually send in checks! For example, when there were HIPAA and Medicaid changes that required updating estate plans, we sent out an explanation letter to clients along with a form to send back in to obtain a pre-packaged amendment which they could either then sign on their own or come in at a small additional fee and sign at our office. These types of projects, which come up only as there is a true significant change in the law, have actually resulted in several times more total revenue than a comparable maintenance fee plan. And I should also note that the revenue does not take into account future estate and trust administration fees. When disgruntled annual maintenance fee clients walk away from your program, they often also walk away from your firm (without you knowing it) and you lose that potential administration work! The bottom line is this…my firm generates over $1 million of annual, recurring revenue from our existing clients through this free service package approach. This amount comes in regularly even when there are no new law changes or new “products” for us to sell because clients often wind up changing their trustees, beneficiaries, the beneficiaries’ percentages, or how and when they will receive their inheritance. Even if your client fees are less than those used in the above example and you scale down the numerical results, you can still enjoy significantly increased profits utilizing the free service package approach. Plus, you’ll have happier clients that will speak highly of you to others because clients don’t want to pay for what they don’t need or want! Please don’t get me wrong. I believe in doing what is tested and proven to work. If you have a maintenance fee program that is standing the test of time – – I mean has been in existence for a minimum of 3 to 5 years without significant fall off and you’re still making a tidy net profit – – don’t fix it! (And please drop me an e-mail to tell me all about it, because we’d love to feature your story in a future newsletter for those that are trying to find a maintenance fee plan that really is working!) But from what I’ve seen and heard, if you are using an annual maintenance fee program, you may be headed for a big fall off the cliff – – when your clients come out of the ether (or get awakened by your competitors who show why their free service package approach is much better!). You may be thinking, “Okay, I get this concept of the free service package, built on the free client checkup meeting every 3 years, but how do I actually get clients to come in for this 3-year checkup and to purchase additional products and services?” I knew you would ask. I will be covering this in much greater, step-by-step detail in my portion of an upcoming 2-part teleconference series I’m doing with my esteemed colleague, Jeff Matsen, entitled, “The GREAT Debate: Client Maintenance Program vs. The Free Service Package”. For more details and to participate, click here. 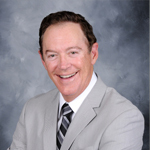 Attorney Philip J. Kavesh is the principal of one of the largest estate planning firms in California – – Kavesh, Minor and Otis – – now in its 38th year of business. 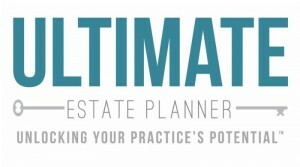 He is also the President of The Ultimate Estate Planner, Inc., which provides a variety of training, marketing and practice-building products and services for estate planning professionals. If you would like more information or have a question for him, he can be reached at phil@ultimateestateplanner.com or by phone at 1-866-754-6477.